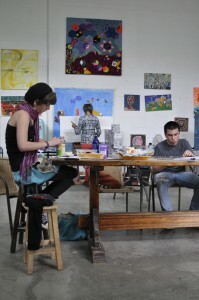 PENTASIETE Art Studio focuses on teaching and promoting art which is the reason why we dedicated a space only for artists. We believe in art and that´s why we encourage the community to be part of the artistic world with the help of workshops and clinics. We know that by practicing is how you really learn so we try to give each artist the opportunity to find their “own language”. PENTASIETE Art Studio´s mission is not only about teaching but creating an artistic culture which is why we ought to find the correct ways for each artist into their own art. We believe in experimentation but we also believe in process, so our workshops are a mix between basic technic in the beginning and then a more personal and free style. At the end of each workshop we generate spaces for our students to promote their own art. In order to support our students in their artistic growth we have a small library and Internet connection (Wi-Fi) so they can expand their theoretical and practical knowledge. We also have the complete support from our professors who are active artists and are willing to help students into participating in professional projects.